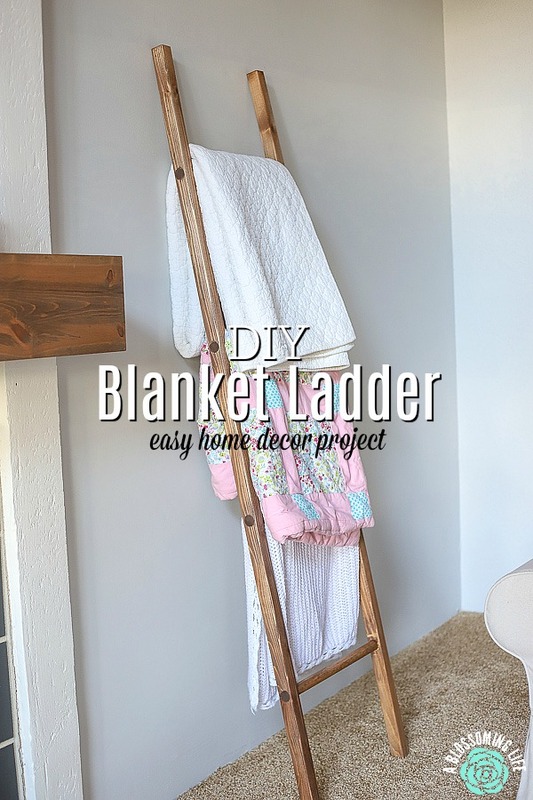 DIY Blanket Ladder is a simple home decor project that will make a big impact. Follow my step-by-step tutorial to learn how to make your own DIY blanket ladder, without any screws. Follow my tips below for constructing this simple home decor project that only costs around $15 dollars to make. To make this project, you will need: 2-6 foot 2x2s, 1-inch dowel rods, drill, saw, hammer, wood glue, spade drill bit, stain or paint, paint brush and paper towels. I had the idea to create a blanket ladder after seeing multiple decor bloggers showcase them on their Instagram feeds. I love how the ladders are a fun, rustic way to showcase pretty blankets, or even wreaths. But being a super cheap person, I couldn’t justify paying a hundred dollars, or heck, even $30 on a blanket ladder. So when my parents came to visit, I knew this DIY blanket ladder would be the perfect father-daughter project to complete. And now, we have a special keepsake that can be treasured for years to come, and the memory of creating something together. 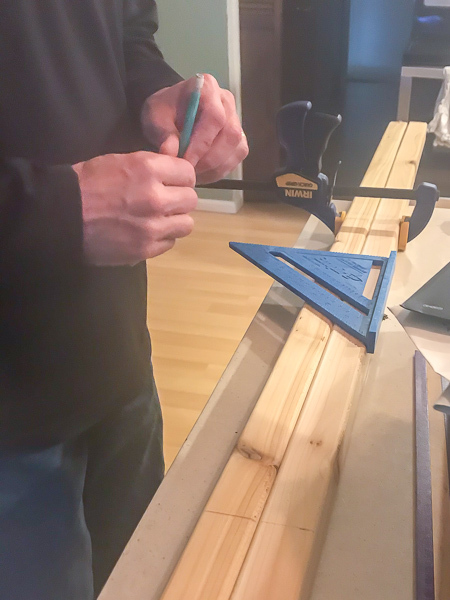 It was such an easy project to complete, and it was fun having my dad show me how to make certain cuts (I was scared of saws until I finally jumped in headfirst and used one for the first time making a fireplace mantel). My dad is one of those people who is good at just about everything he puts his hands to, and growing up, he would build stuff all the time. Being the punk kid I was, I wasn’t interested. I’m totally kicking myself about this as an adult, thinking about all the skills I missed learning, but I’m enjoying the time I get to spend with my dad learning from him now. When it comes to decorating this house, I really want to make it beautiful. The only problem is, we don’t have a lot of extra cash. And any extra money we do have is being saved up to purchase a car (you know, one where the AC and trunk actually work). So over the next few months, as we decorate this house and make it our own, we are going to be really stretching our creativity to spend as little as possible. 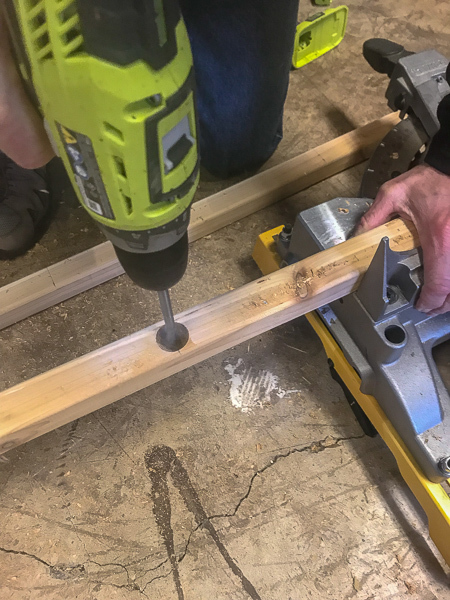 When drilling holes for the dowel rods, it was helpful to place a piece of scrap wood behind the piece of wood we were drilling. It helped it not split as much. Use a scrap piece of wood between the hammer and the ladder when pounding the dowel rods into the holes so it won’t damage the ladder. 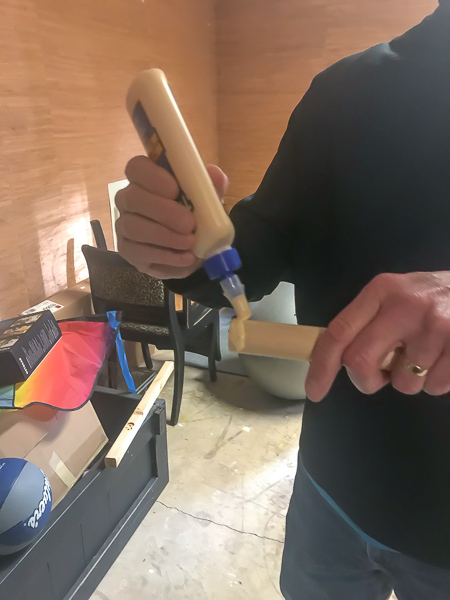 Using wood glue on the part of the dowel rod that will be inserted into the drilled holes will help keep the dowel rod in place and tight. Sand off the sides of the of the ladder well to give it a more finished look. Make sure to sand off any extra glue so the stain will adhere. Need more DIY project inspiration? Check out some of my favorite tutorials? How To Paint Fireplace Tile – If you want a inexpensive way to update ugly, outdated tile, try this. DIY Minimalist Wreath – I get so many compliments on this easy wreath. How To Build A Fireplace Mantel – my first ever woodworking project; so easy, I can do it. Our Budget Kitchen Remodel – seriously, you won’t believe the transformation! DIY projects don’t have to be hard or daunting. If you are willing to take a risk and do some hard work, you can make any space pretty without a lot of money. 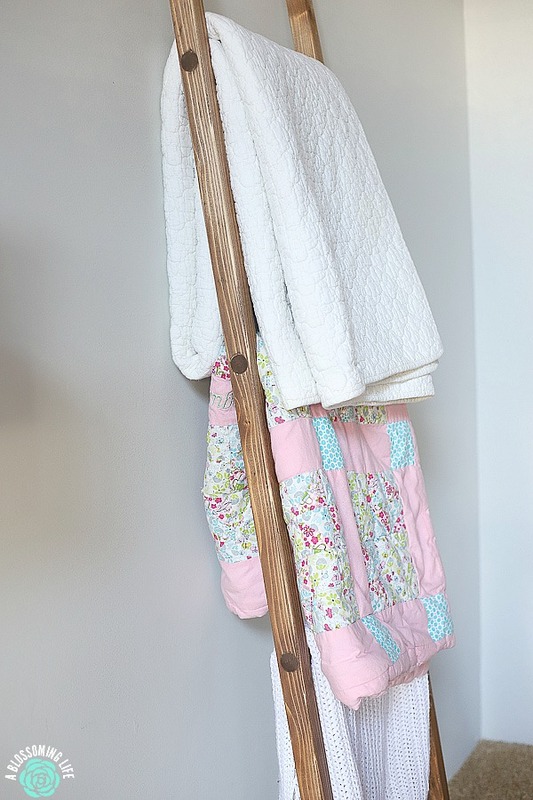 Okay, so are you ready to start building your own DIY Blanket Ladder? Grab your hammer and let’s get to it. If you have about 30 minutes to an hour and a few materials, you can totally make this project. By the way, this project turned out super cheap because I used stain and other supplies we already had on hand. The only thing we needed to purchase was the wood. Gather materials. Cut two 2×2 pieces of wood to desired height. We made a six-foot ladder, so we cut two pieces of wood six feet long. Cut 4 dowel rods to size; we cut them 18 inches each. On the 2x2s, evenly space out where you want your dowel rods to go and mark. We did ours every 12 inches. Drill holes using spade drill bit all the way through the 2×2. It is helpful to place a piece of scrap 2×2 behind the ladder when drilling to help prevent it from splitting. After all of the holes are drilled, add a touch of wood glue about a quarter inch from the ends on the dowel rods and place dowel rods into holes. Gently hammer into place if needed. 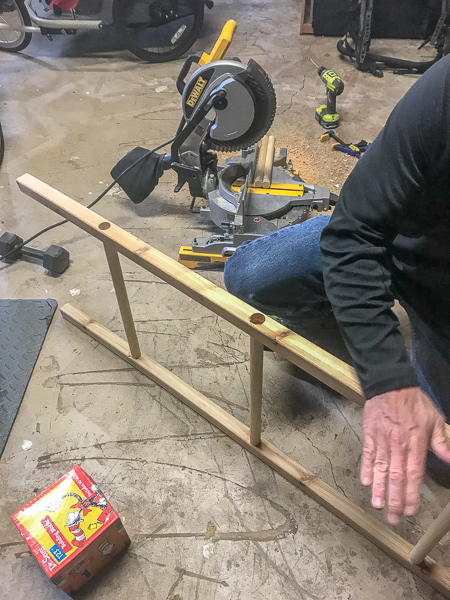 We did all the dowels on one side of the ladder first before placing the other side of the ladder onto the other dowel rods. Add wood glue again to the dowel rods about 1/4 inch from the end and place the other 2×2 on top of the other dowel rod ends, wiggling into place. Using a scrape piece of 2×2, place on top of the ladder 2×2, and gently hammer into place. Wipe any extra glue off. Once dry, sand the ladder down, and sand the edges with the exposed dowel rod to make it flush. Stain or paint ladder and allow to dry. Place in a room and hang pretty blankets on top. See that totally wasn’t hard right? 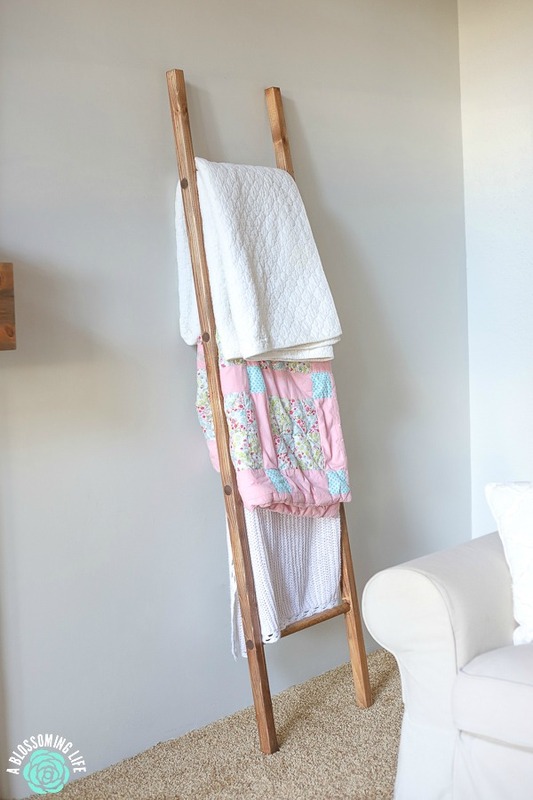 If we can make this DIY blanket ladder, so can you. I’m thrilled at how it turned out, and now we have a family keepsake to hand down to the kids… ’cause I’m sentimental like that. Have you ever tried your hand at a DIY project before? Really sweet project! Love that you made it with your dad. It will be so special for your kids someday! Thank you Lauren!! Yes, I really hope they can appreciate it. Stuff like this really makes my happy. I have some old paintings from my grandma, they just never go out of style when you love them so much. Hope you all are doing well. I use old wood ladders, that I paint to clean up, to hang my blankets. I love ladders to showcase my favorite quilts and blankets. Great idea for someone who wants to make a homemade ladder. I love that! Probably adds so much character! Thanks for the great post and DIY info! I have a bamboo ladder that I used to use in my shop as a display prop.. I use it now at home.. like this.. It’s a great way to enjoy our quilts, and festive!